Located on the site of a former steam powered silk mill and later an enormous Brooke Bond tea packing factory, Redbourn Village Museum explores the history of the village of Redbourn. 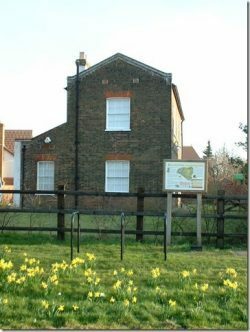 The museum is supported by Redbourn Parish Council and Friends and has been managed and staffed by volunteers since opening in 2000. Photographs and memorabilia have made their natural home in the thriving village museum. Its three rooms consider the history, industry and people of Redbourn village through permanent and changing exhibitions and film footage. A selection of local history books and pamphlets are on sale as well as videos and postcards and a Village Trail leaflet. The museum is very attractively sited in the 19th century Silk Mill House overlooking Redbourn Common, next to The Cricketers pub and surrounded by gardens with seating and outdoor exhibits. The garden is used for special events throughout the year. Due to ongoing refurbishment of the interior, some displays may be removed temporarily. We apologise for any inconvenience but will try to make as much of the collection available as possible. Open Saturday and Sunday 2 – 5 pm (last admission 4.30 pm) 3rd February to 25th November 2018. No entry charge but please donate generously if you enjoy your visit. You will get an extraordinary glimpse of the village throughout its varied history in our galleries, two on the ground floor and one upstairs. There are 2 children’s quizzes and dressing up clothes for under 10s. The Priory Room opens with 13thC drawings of the martyrdom of St. Alban and his mentor, St. Amphibalus who was put to death on Redbourn Common. As a result, a small priory was founded here and some of the medieval priory stones are on display in this room as well as items from the Stone Age through Roman times to the 19thC. A feature on wells and water pumps includes a rare example of a 16thC tree pump found on the priory site. In the Occupations Room, is evidence of the amazing wealth of employment that this small village has provided, especially during and after the boom in coaching trade of the 1700s. There are many photographs and exhibits of domestic life. A colourful frieze illustrates some of these trades, creating a bright image of Redbourn’s social history. As well as those working in agriculture, the villagers did straw plaiting and found jobs in the hat factory, silk mill, jam factory and later the Brooke Bond tea packing factory. There are displays on these and also the coaching inns and railway, known locally as The Nickey Line. Find out about Dr Henry Stephens who invented Stephens Blue-Black Ink, practiced medicine in the village and was a friend of poet John Keats. Ann Skillman was a villager devoted to collecting any conceivable items that were part of Redbourn village life. Our changing displays are now exhibited in the first-floor room, named the Ann Skillman Gallery in her memory. One of the most valuable historical records is the extensive cine film footage of life in Redbourn in the late 1940’s and early 1950’s, made by John Heather and now on view in this room. Here we also display the Millennium Wall-hanging crafted by the Redbourn in Stitches group, a true village effort. It depicts the village on a summer’s day creating an atmosphere that all local people will appreciate. More recently, Redbourn celebrated the 900th anniversary of St. Mary’s Church with a remarkable series of Redbourn 900 events. In 2011, the museum initiated an ambitious project, “Redbourn Through the Centuries”, which aims to explore the last 900 years of history in more detail as we concentrate on one century each year, taking us from the 1100’s to the present day through themed exhibitions, events and outings. Our journey through time will finish in 2020 with a grand finale. 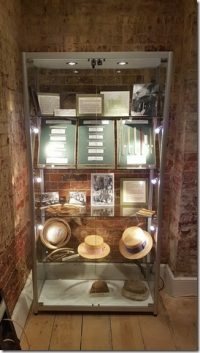 In May 2016 we launched our Museum Village Walking Trail which has been put together to give visitors a taste of historic Redbourn. The trail starts and finishes at Redbourn Village Museum, where parking is available during opening hours and should take approximately 2 hours. Please do come and try it and take time to visit the museum too as there are many exhibits which give further information about what you see on the trail. NO ENTRY CHARGE BUT PLEASE DONATE GENEROUSLY.